View More In Panel Flange Tools. You are looking at a set of Car Dismantle Tools For Video and Audio System. Helps you removing car radio and repairing other parts of your car without damaging the car interior! 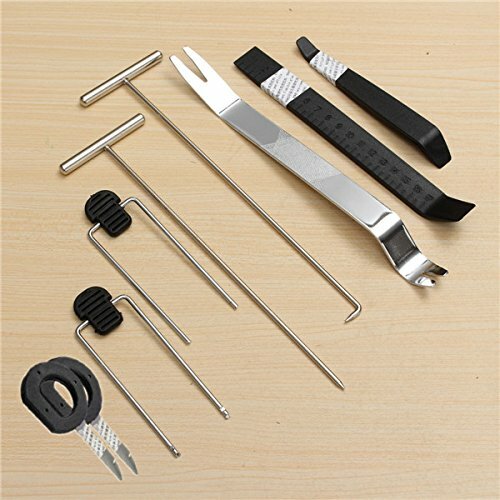 This tool set is the best car tool box for car owners, including 9pcs different kinds of tools for dismantling and assembling of radios, speaker grills, panels etc. The selection of stainless steel and non-breakable plastic offer various level actions without damaging the car interior. Easily remove Trim, Molding, Door panels and Dashboards. Great for automotive snap on trim panel and molding removal. Also works great for furniture repair soft and hard woods, antiques restorations, upholstery, leather work etc. This product has powerful functions can dismantle all automobile types appearance,face plank,door plank,nail and so on function. Have increased size measurement,small iron hammer,screw are contrapuntal,the hook line,pull line,pull carpet,drill,rub machine frame,rub bodywork and so on function. Works on interior and exterior trim, wide edge remover, narrow edge remover, pull-type remover, handle remover and upholstery clip remover. You are looking at a set of Car Dismantle Tools For Video and Audio System. Helps you removing car radio and repairing other parts of your car without damaging the car interior!